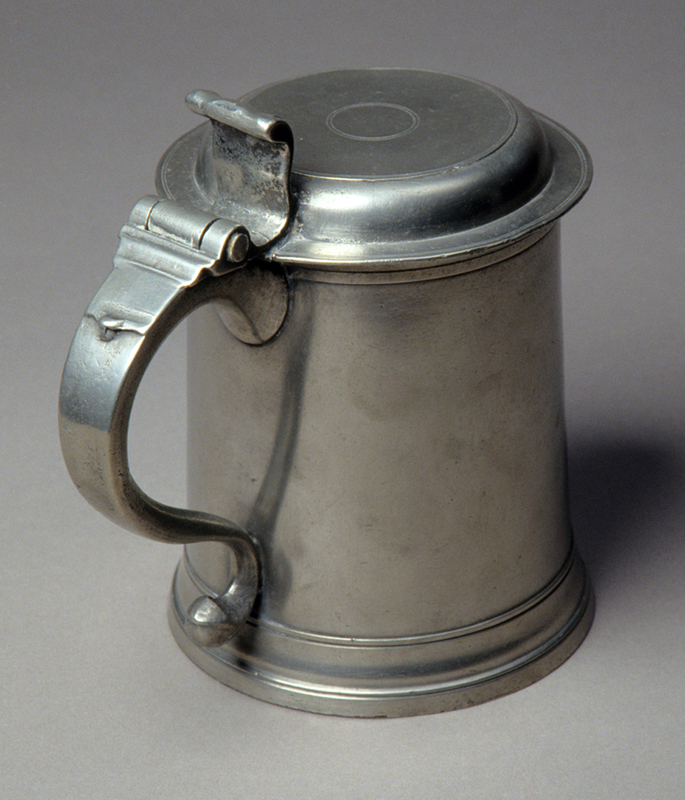 In the American colonies of the 1700s, pewter tankards were expensive and prestigious vessels. In a society known for its consumption of hard cider, beer, and malt, drinking vessels played an important role. Pewter was valued as a luxury item, and a pewter tankard with a lid established the status of the owner and also protected his beverage from insects. Tankards were particularly popular in New York State, where this example was made. The simple, flat lid and barrel-shape body was considered to be old-fashioned by the mid 1700s. However, the design remained popular in parts of New York for a long time. Henry Will, a German-born pewterer, made and marked this tankard, probably during the years he spent in Albany, New York. 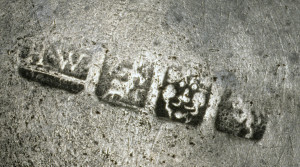 Will’s mark as well as his initials, HW, and three pseudo hallmarks appear on the bottom of the tankard. 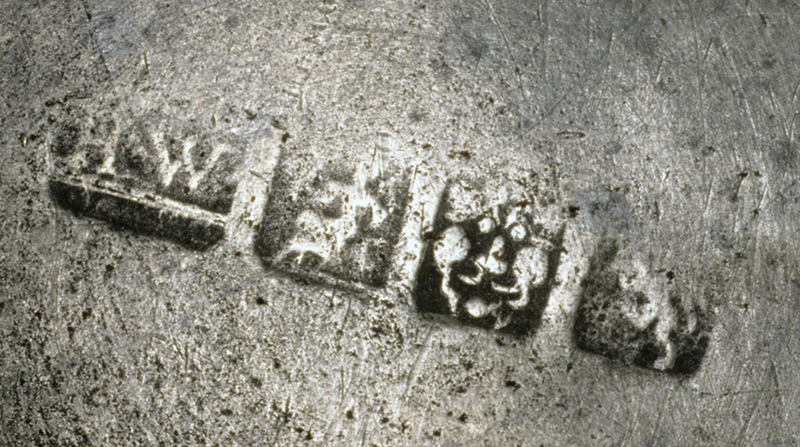 Although America has no system of hallmarks, pewterers and silversmiths often used pseudo hallmarks on their goods to imitate British practices. Most craftsmen kept account books recording their business transactions. These volumes provide clues about craft and business practices, changing styles, and clientele. 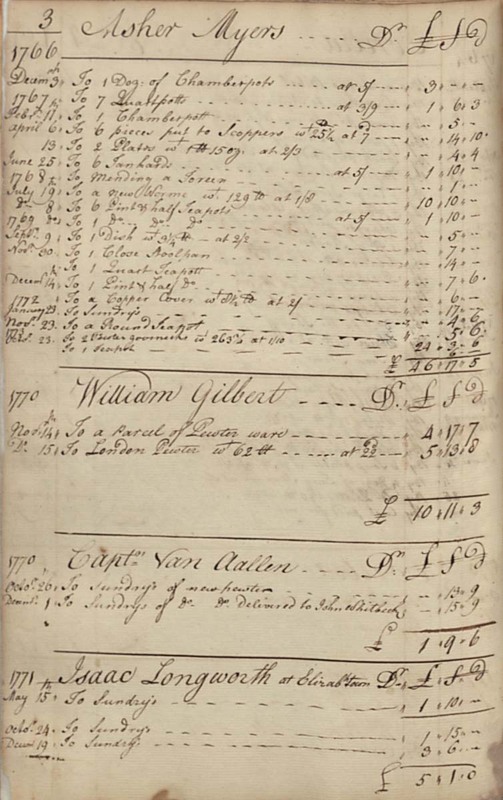 Henry Will’s account book reveals that a new pewter tankard cost 5 shillings, one of his most expensive products. Some customers made partial payment to Will in old pewter that he melted to make new vessels. Also, a significant part of Will’s business was repairing old pewter. John Worlidge wrote this treatise to improve the quality and thereby increase the consumption of hard cider, a common beverage in Britain and colonial America. Vessels like the Henry Will tankard were used for beverages like cider. 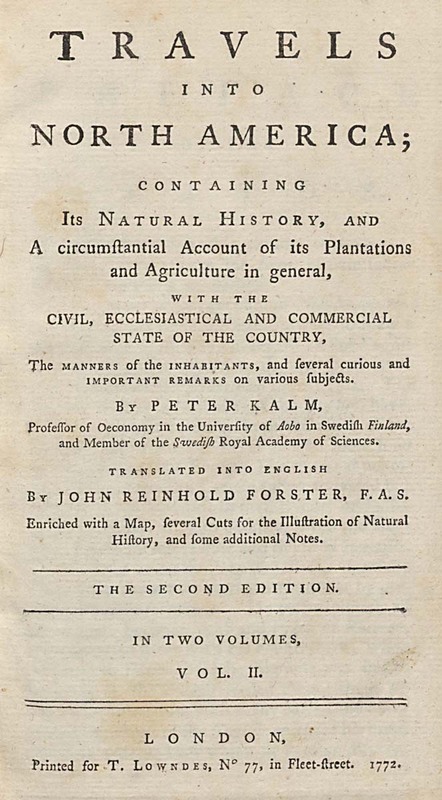 Swedish naturalist Peter Kalm wrote this account of his visit to Albany, New York, in the 1740s. 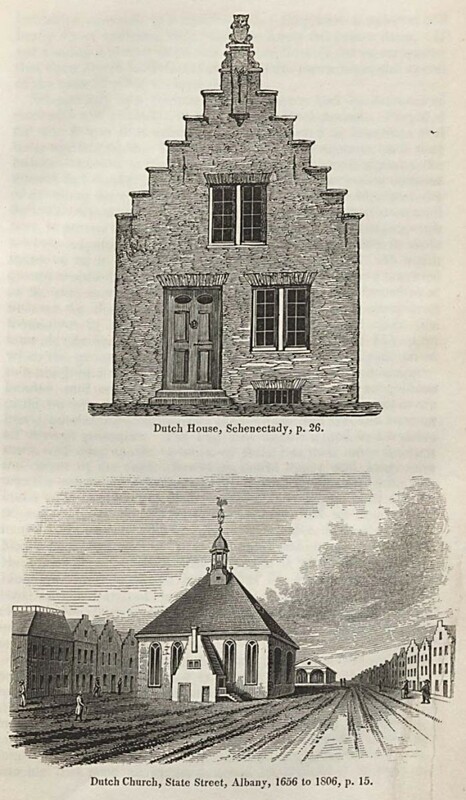 In Albany he found people who still embraced Dutch customs, language, and architecture, as can be seen in the stepped-gable house pictured in the Watson book. This persistence of Dutch culture may explain why Albany residents preferred an old-fashioned tankard style. 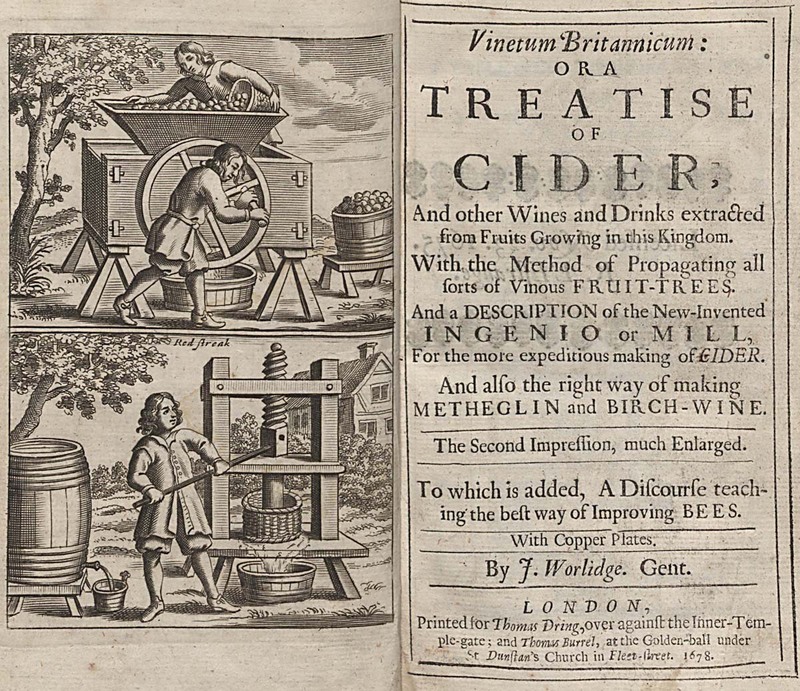 Kalm also noted a possible reason for the tankard’s popularity: apple orchards were abundant in the area, and they produced excellent hard cider. 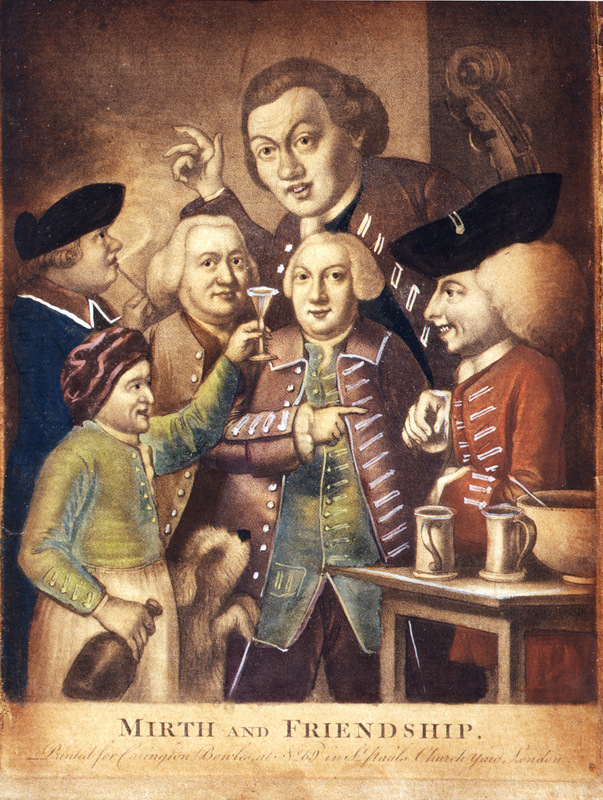 Mirth and Friendship illustrates a typical tavern scene featuring a punch bowl and ladle, two lidless tankards, and wineglasses. Lidless tankards, or mugs, were common in taverns. The more expensive lidded tankards, like the Henry Will example, were usually owned by individuals. 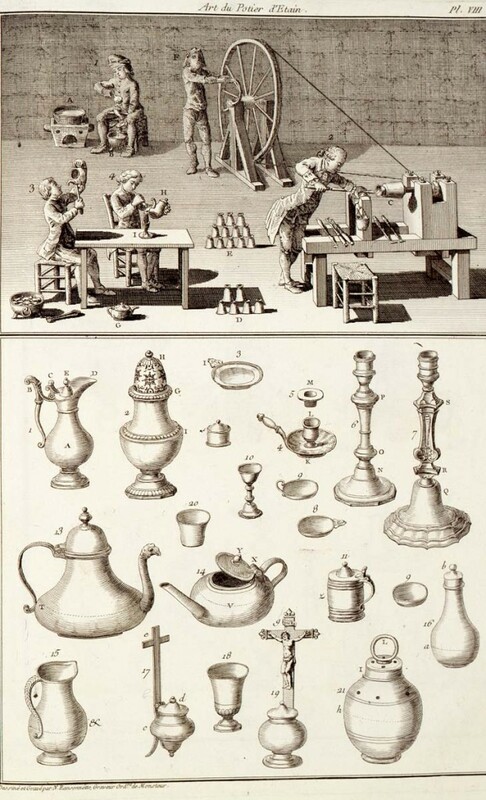 This volume on pewtermaking is part of the Descriptions des Arts et Métiers, a series of 81 publications issued between 1761 and 1788 that recorded the details of every industrial process in France. The illustrations show each step in making a tankard. A pewterer melted his ingredients before casting the parts in molds, refining the shapes on a lathe, and then soldering them together. After a final polishing, most pewterers marked their wares to identify the maker and, sometimes, the quality of the metal. The Compleat Appraiser provides detailed instructions for identifying and valuing different grades of pewter. Pewter is a mixture of tin, lead, and other metals, but the exact composition varies widely. High-quality pewter is made with a high tin and low lead mixture. Lower-quality pewter contains less tin and more lead. 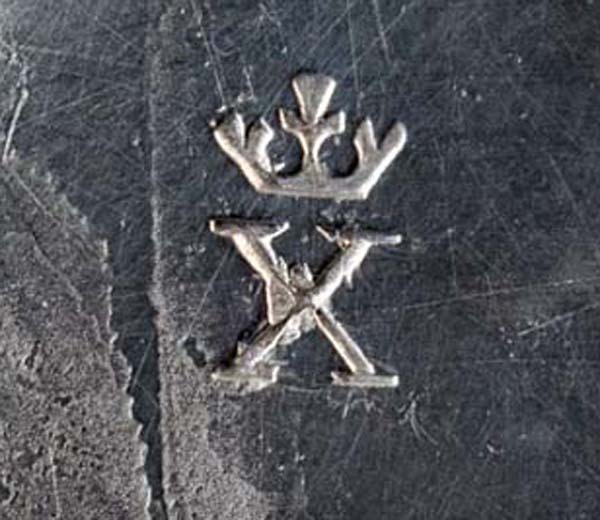 According to The Compleat Appraiser, the highest grade of pewter resembles silver and was commonly marked with a “crowned X.” Lower grades were unmarked and were coarser in appearance. 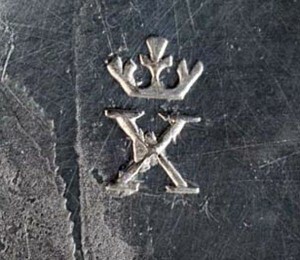 That bit of information, when combined with a scientific analysis of the pewter, has helped museum staff interpret the meaning of the crowned X and quantify the proportions of the metals that are present. The Henry Will tankard is not marked with a crowned X. It is made of lower-grade pewter than the Henry Will hot-water plate, which is marked with a crowned X. Perhaps Will did not have access to high-quality pewter for the tankard or perhaps his client would not agree to pay for it. 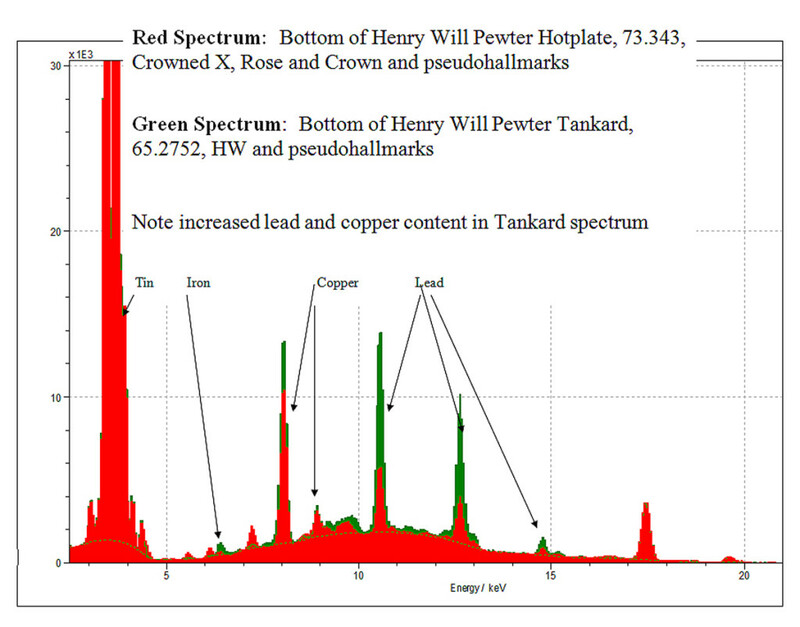 The scientists in Winterthur’s research laboratory determined the chemical composition of Henry Will’s pewter by using energy dispersive X-ray fluorescence testing. 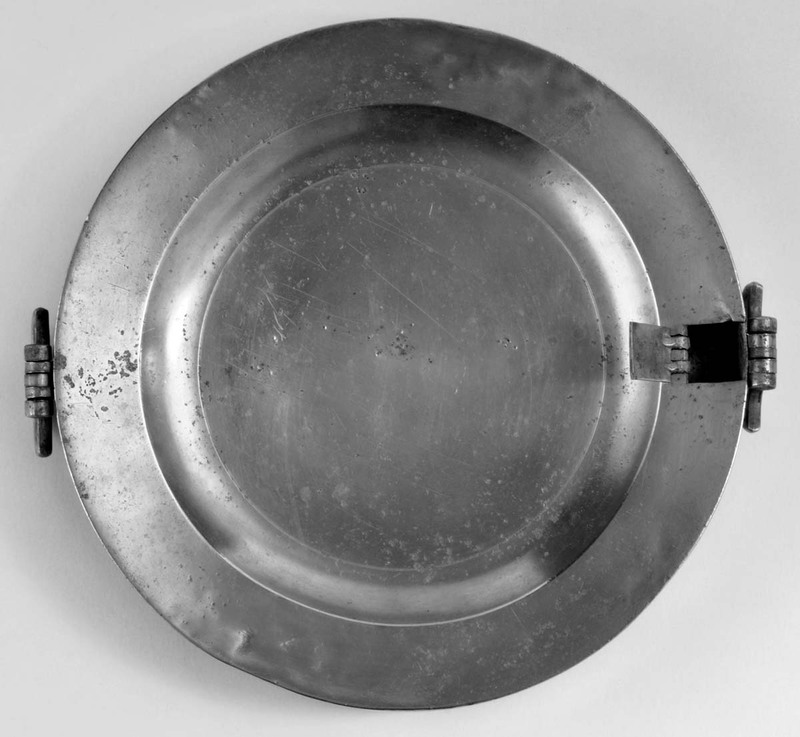 This analysis revealed that the marked hot-water plate contains significantly more tin and less lead than the unmarked tankard, confirming that the crowned X mark indicates high-quality pewter.